Concrete floor: 36’ x 128’ x 4” with fibermesh reinforcement and zip-strip crack-control. (2) 10’ x 8’ raised panel steel overhead doors. (5) 10’ x 11’ raised panel steel overhead doors. The goal at PermaBilt® is to deliver quality, not only in the building, but in the process as well. That’s why PermaBilt’s employees have been trained to provide optimal customer service throughout the process from initial design to final completion. PermaBilt’s strict quality control standards and innovative financing programs have made the post frame builder a leader in Western Washington. 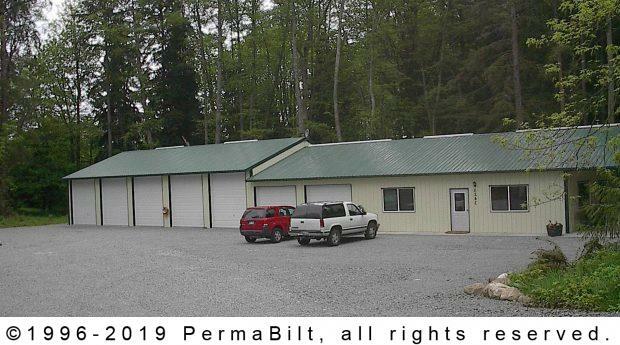 That’s why our Camano Island Washington client has used us to construct 13 of his post frame pole buildings: he appreciates the quality we put in every one of his buildings. So when he wanted a building for his RVs plus living space we were ready to work with him on his design that included unique details such as a sliding glass door for his living space. There were additional permitting requirements outside the scope of our work, so the customer obtained the building permit also submitting the necessary paperwork, layouts and calculations for the living space. Once we completed the construction of the building, the customer and other contractors finished the interior and all plumbing and electrical for a functional, beautiful space.